Parasol unit foundation for contemporary art is delighted to present works by Bharti Kher in her first solo exhibition held in a public art institution in London. The exhibition is composed of a selection of works from the recent past, with an emphasis on the artist's sculptural works. Known for her extensive use of everyday, found objects and imaginatively transforming their identity, Kher empowers her often otherworldly creations to present themselves unabashedly as if they were a natural part of our culture and environment, Kher's work often explores the notion of the self as a multiple, open to interpretation and shape-shifting. Her art practice is intimately intertwined with her life, not only because she borrows motifs and artefacts for her work, but also because she has an inquisitive mind and a strong desire to understand sociological issues such characteristics endow Kher's work with a narrative quality and fascinating interiority of things that frequently contradict her practice of addressing more global and collective concerns. This tension is precisely what leads us more deeply into Kher's work and world and prompts us to reposition our own relationship to her individual pieces. Kher is perhaps best known for her elaborate and stunning bindi dot paintings: abstract, swirling constellations of colourful bindis glued to flat surfaces that create unique imagery somewhere between being illusory and hyper-realistic. But in recent years her artistic creations have become increasingly bold and unrestrained, several examples of which are on show in the exhibition. 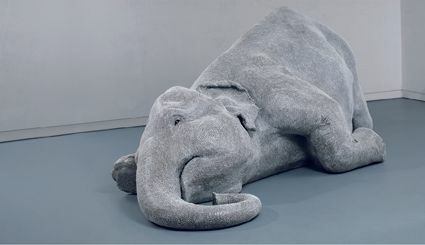 The phenomenal, life-size elephant that is The skin speaks a language not its own, 2006, made of fibreglass and covered with serpent- or sperm-shaped white bindis, bears a symbolism that leaves viewers uncertain about the animal's condition. The title of the work, always an important component of Kher's works, suggests that physical appearance and inner values are often in conflict. Another prominent sculpture in the exhibition, Solarium Series I, 2007'2010, is a 9-foot-tall fibreglass tree, its branches covered with hundreds of what seem, at a distance, to be golden autumnal leaves of extreme delicacy. On closer inspection, one sees that these leaves are actually miniature, waxy-looking heads of various fantastical creatures. Also on show is Kher's The deaf room, 2002-2011 a sculpture made of dark glass bricks. It is seemingly a strictly aesthetic minimalist work, but when one learns the origin of its bricks it begins to reveal its feminine bias and a wealth of symbolism. The barely translucent dark bricks are made from melted glass bangles, those that Indian women traditionally wear in multiples on their wrists. The merest hint of the radiant glow of bangles only becomes apparent when the bricks are exposed to light behind the gestural clay build of the work. The deaf room, 2002-2011 stands for the absence and memory of a woman, in an emptied room. Finally, Warrior with cloak and shield, 2008, a life-size fibreglass figure of a woman adorned with exaggeratedly huge stag's antlers, is part of a series of hybrid half-human, half-animal figures, which again testifies to Kher's non-abidance mind and unflinching imagination.